- Appearance (Terrain): A beautiful meadow of green water, green sky and blue grass covered by hydrangea plants. 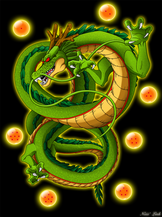 History: Namek has three suns, so it is never night time. Despite this, depictions of the planet show there to be a dark side. It is possible that the planet is tidally locked to the star group, resulting in the lack of a day/night cycle, with the Nameks living on the daylight side of the planet. A Namekian year is much shorter than an earth year, at 130 days long. The Namekian atmosphere does partly consist of oxygen. The Namekians could use this for their respiration process. It is also home to a host of ambient life, such as fish, frogs, slugs and dinosaurs.